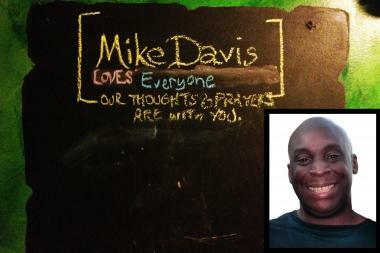 A chalkboard eulogizes Michael Davis in the bathroom of the Poitin Stil, where he broke up a bar fight between his alleged attackers and another patron. ROGERS PARK — Family and friends continue to raise money for baseball bat-beating victim Michael Davis, who remains in the hospital since being attacked last month. Two fundraisers — one of them at the bar where he reportedly broke up a bar fight between his attackers and another bar patron — are planned for coming days. "It's been amazing. There are so many people that care who want to help," said Davis' niece Alicia Webb. "It's been phenomenal." On Saturday night, the Poitin Stil in Jarvis Square plans to host the first fundraiser. Organizers say there will be a silent auction, bag toss and pool tournaments, and a raffle. The bar's distributor donated a keg of Stella Artois, and all proceeds from sales of the beer will go to Davis. Restaurant MorseL plans to cater the event. On Monday, a larger fundraiser is planned for Bucktown's Red Door, at 2118 N. Damen Ave. Proceeds from a drink and hot dog special will be donated to Davis from 4 to 9 p.m. Organizers say the barbecue fundraiser will include a water balloon-throwing contest and raffle. Davis' online fundraiser has raised nearly $15,000 so far. Webb said Davis had made "small improvements," but is still in intensive care. "The good thing is that he's clearly trying to communicate," she said. "He's aware when people are in the room with him. He tried to blow a kiss to a couple of people."